SpaceX's historic first Crew Dragon test flight returns to Earth early Friday (March 8), and lucky U.S. East Coasters may be able to see it in action. Those living in parts of the Ohio and Tennessee valleys, the Piedmont region and the southeastern coast of the U.S. may be able to catch a glimpse of the SpaceX Crew Dragon capsule Friday morning as it re-enters Earth's atmosphere with a fiery trail that will end over the Atlantic Ocean a few hundred miles east of Florida. The uncrewed spacecraft launched March 2 and docked with the International Space Station March 3. If the capsule safely returns to Earth, it will pave the way for crewed SpaceX missions to the space station. 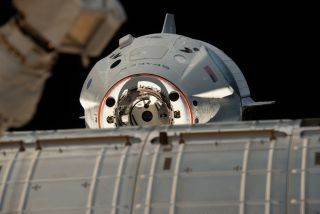 According to NASA's press kit, "Crew Dragon will autonomously undock from the International Space Station on Friday, March 8, at approximately 2:30 a.m. EST [0730 GMT]. About five hours after Dragon departs the space station it will conduct its deorbit burn, which lasts up to 15 minutes. It takes about 35 to 40 minutes for Dragon to re-enter the Earth's atmosphere and splash down in the Atlantic Ocean, which is currently targeted for approximately 8:45 a.m. EST [1345 GMT]." There has been a lively discussion on the satellite observer Seesat Internet List about spotting the bright plasma trail created by the Dragon capsule as it rushes through the atmosphere, quite possibly becoming bright enough to be seen even through the light of day. Dragon's final ground track runs across North America, from approximately just north of Vancouver Island on the Pacific Coast; southeast to Charleston, South Carolina, on the East Coast; and out to sea over the open waters of the Atlantic. Because this is the first time this re-entry vehicle has traveled this particular course, there is some uncertainty about what might be seen. It appears that the best odds of seeing a possible fireball caused by the Dragon capsule will be for those within about 100 miles (160 kilometers) of a line extending from central Kentucky to the South Carolina coast, near Charleston, from about 8:42 to 8:44 a.m. EST. Observers might even be able to hear the re-entering Dragon by virtue of a sonic boom, which would create a distinct "thump" as the vehicle speeds by. The best chances to hear a boom for this to happen will likely be near the South Carolina coast. If you live farther to the northwest — from roughly central Iowa, to central Illinois and southern Indiana — it's worth a try to spot the beginning of the Dragon re-entry. In the Central time zone, cast your gaze upward between about 7:34 and 7:37 a.m.
"When a two-ton satellite enters the atmosphere, usually at a speed close to 8 km (5 miles) per second, it possesses prodigious energy of motion, roughly equal to that of 50,000 cars all traveling at 100 km (62 miles) per hour. Nearly all that energy is converted to heat and light as the satellite plunges into the thicker air. It usually begins to glow at a height of about 90 km (55 miles) and continues its firework display down to a height of 30 km (20 miles). By then it has lost most of its initial velocity, and any remaining fragments begin to fall at a steep angle. People who have seen a satellite burn up all agree that it is a spectacular sight." Sadly, as of this writing, the latest weather forecasts suggest rather cloudy skies across much of the potential visibility zone on Friday morning.